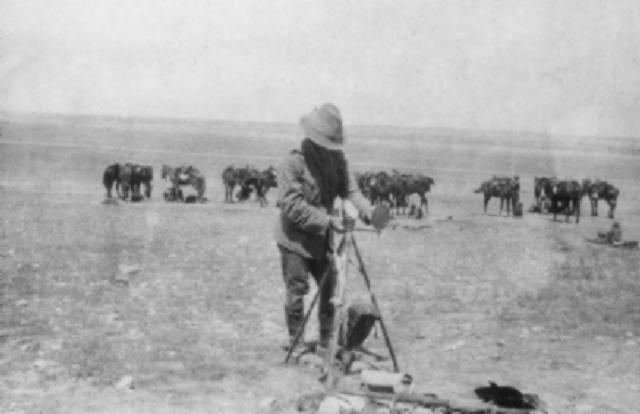 1st Australian Signal Troop operating a heliograph. At the conclusion of the war, Major R. Smith produced an unpublished manuscript in 1919 called 1st Australian Signal Troop, which included a section specifically related to the battle of Beersheba and is extracted below. 30-10-17 The attack on Beersheba On 30-10-17 observation posts were established on Gebel el Sherief - Point 1615 and Point 1240 in communication with 1st Signal Troop by visual. At 1800 1st Signal Troop moved with 1st ALH Bde in rear of Anzac Mounted Division on the Asluj - Gebel el Shegeib Road to attack Beersheba from the east. At 1000 on 31 October 1917 Headquarters 1st ALH Bde were established at Point 1370 Iswaiwin. At 1015 the 3rd ALH Regiment moved across the open plain to attack Tel el Saba establishing Regimental Headquarters in the Wadi at the "W" of Kh el Watan in touch with 1st ALH Bde Headquarters  on Point 1130 by visual. Lateral communications was established with NZMR Bde on our right, this touch being maintained throughout the day. At 1300 the 2nd ALH Regiment moved up to support 2rd ALH Regiment on a frontal attack on Tel el Saba and 1st ALH Bde Battle Headquarters were established at the old 3rd ALH Regimental Headquarters, this Regiment moving forward up the Wadi towards Tel el Saba. The 3rd ALH Regiment mad a frontal attack on Tel el Saba at 1400, their headquarters being in communication with Battle Headquarters by telephone and the line ot them was twice extended during the attack as the Regiment closed on Tel el Saba. Telephone communication was also established with Headquarters 2nd ALH Regiment operating on the left flank of the 3rd Regiment on the bank of the Wadi el Saba, the 1st ALH Regiment in reserve on the plan and Divisional Headquarters on Point 1130 by visual. The Inverness Battery in the Wadi immediately north of Kh el Watan, which was supporting the attack on Tel el Saba, was placed in telephone communication with Battle Headquarters and with Headquarters 2nd and 3rd ALH Regiments making the attack. Each Regiment in the line had telephone and visual communication with their Squadrons and Machine Gun Sections. The telephone communications between Squadron Commanders in the front line and the Inverness Battery resulted in enemy machine gun positions, which held up our advance at various times, being destroyed by battery fire thus making front line advance possible. The 1st ALH Regiment being in reserve and the traffic going through to them being small, telephone communications with them was not considered necessary. Flank communication between 1st ALH Bde and NZMR Bde was maintained during the attack between Brigade Headquarters and front line troops. All available wire on telephone pack sets having been used between Battle Headquarters and Regimental Headquarters and the remainder on the Signal equipment being in "A" Echelon, which had not arrived at this stage, it necessary to reel up and re-lay cable as the advance proceeded. Motorcyclist Despatch Riders did invaluable work taking messages both forward and back, often under heavy shell and machine gun fire. Their work was particularly good as the ground was interspersed with Wadis and no roads existed. Tel el Saba fell at 1530 the retreating enemy being followed by 2nd and 3rd LH Regiments who kept in touch by visual. At 1650 the 1st LH Regiment advanced on Beersheba occupying the line from the Mosque inclusive to Point 970 inclusive. This line was occupied at 1730 blocking all exits from the town. meanwhile Brigade Headquarters had been established at Point 960 and all units of the Brigade concentrated there were placed in telephone communication, the Brigade itself being in communication with Anzac Mounted Division by telegraph. On 0730 on 1-11-17 Headquarters 1st ALH Bde were established half a mile west of Point 960 on the Wadi Saba, telephone communication being re- established with all units of the Brigade. At 1700 on 1-11-17 a visual station was established at Point 1020 in touch with one Squadron 2nd ALH Regiment at Kh el Lebiyah and with Headquarters ICC Brigade at Point 1510 Towal Abu Jerwal. These stations were withdrawn on the morning of 2-11-17 when 2nd ALH Regiment withdrew to camp.